Two elite National Security System (NSS) agents, Hyeong-Jun (Lee Byung-Hun) and Sa-Woo (Jeong Jun-Ho), who were sworn blood brothers, both fall for fellow agent Seung-Hee (Kim Tae-Hee). Sa-Woo attempts to suppress his feelings for Seung-Hee and wishes the couple the best. Hyeon-Jun is then sent off on a solo mission to Hungary. In Hungary, Hyeon-jun accomplishes his mission and while in escape mode becomes wounded. Shortly later, Hyeon-jun finds out that he was betrayed by fellow agent Sa-woo. Seung-Hee attempts to help Hyeon-Jun escape, but a car explosion separates the two and both are misled to believe that the other persons are dead. 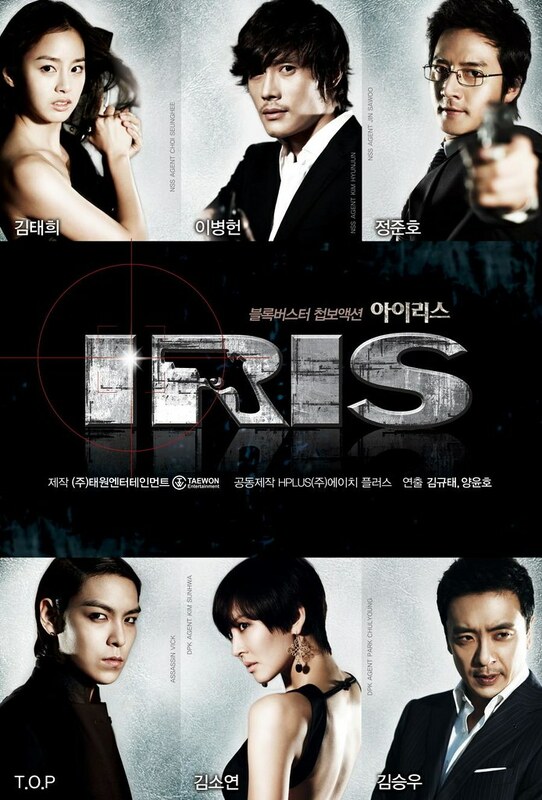 Hyeon-Jun is then saved by an unknown voice and learns of the secret society “IRIS”. One year later, Hyeon-Jun returns to Korea to seek revenge. During this time, the two Koreas are set to reunify, while the group “IRIS” are intent on stopping the reunification. After a long consideration, I decided to watch IRIS. At first, I thought I didn’t like it because of the politics and all that I don’t understand. But once I put my mind away from the politics and just enjoy the story, I kind of like it. This Korean drama was such a hit and I can understand why. With all the actions like shooting and fighting and spying and everything, I think it deserved the popularity. I think Lee Byung-Hun is awesome and really fit the role as Hyeong-Jun. He really has the charisma. Seriously. I love the chemistry between him and Kim Tae-Hee’s character, Seung-Hee. Even though it all happened so quickly, but they really have the chemistry. It is so sweet to see them together. Kim Tae-Hee is a great actress and she looks awesome and cool with those guns and all. She really is great. So, now we all know that she can do not just melodrama only, but she can also do actions too! That’s awesome, right? No wonder she’s one of my favourite actresses too. As for Lee Byung-Hun, well, what can I say? He’s such a great actor. No wonder that many Korean actors want to be like him. He has played several Hollywood film now, including Terminator Genisys (2015), even though in that film, he only played a small part as T-1000 and didn’t speak at all, but still, he’s very good at it. However, he played a bigger role in G.I. Joe: The Rise of Cobra (2009), G.I. Joe: Retaliation (2013), and also RED 2 (2013). He’s such a great actor! He has played alongside with top actors like Bruce Willis, Arnold Schwarzenegger, Channing Tatum, Anthony Hopkins, Helen Mirren, and many more. So, yep, there’s no doubt about his acting skills in IRIS too. He has good chemistry with Kim Tae-Hee. Their love story in IRIS is undoubtful! You can actually feel they are in love. No wonder they are one of the best on-screen couples. Let me tell you something, IRIS is like another version of Game of Thrones where many of the characters died. The character that you thought would last until the end, he or she died. This is the type of film—or TV Series, to be exact—that plays your emotion really well. When you finally smiling, they just made you cry again. I’m just a little pissed off to that fact, but anyway, it’s still a good TV series. There are so many times that I felt sleepy when I watched IRIS, perhaps because of the politic stories, but I like it when they started the action or when Hyeong-Jun was with Seung-Hee. I think it’s because I don’t really understand Korean’s politic issues, therefore I don’t really get what they meant. Maybe, just maybe, if I really was paying attention I will understand it but since I didn’t really pay attention, I don’t understand. At least I understand that majority and the main problem of the story but to be specific, I can’t really get it. Anyway, what I like about this Korean drama besides the chemistry and action is the setting. Everything seems surreal and real at the same time. They really didn’t make IRIS half-way. The bomb, the shooting, the secret agency place, the different countries like Japan and Hungaria, and everything are done really great and full totality. It’s great and enjoyable to watch. Overall, IRIS is a good drama, great drama actually considering the setting and all, even though the story is kind of heavy to catch. However, it’s still enjoyable. The love story is even lovely and not too much. And after much consideration, I give IRIS 7.5 out of 10 stars.